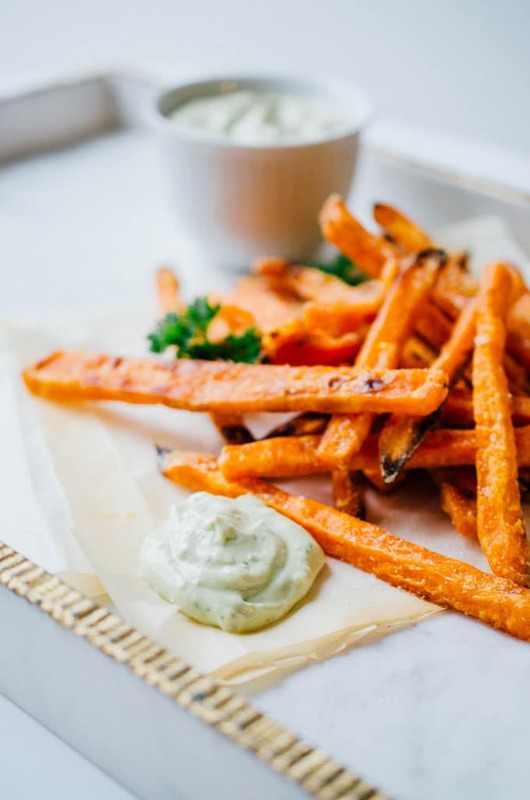 These Baked Sweet Potato Fries are crispy on the outside, tender on the outside, and dipped in a creamy, herby avocado sauce. It’s Friday! And who ever decided Fridays should be pizza days? Fridays should be fry days! Like, deluxe, could-be-considered-a-meal fries. And okay, maybe these simple sweet potato fries can’t quite be considered a meal in themselves. But did that stop me? No. Hard no. You know why I can warrant eating fries for dinner? Because I’m moving to Europe tomorrow. LITERALLY TOMORROW. Which means there is nothing left in my apartment to eat. And as I write this, a few days after cooking up these fries, I actually have nothing left but my 3 packed-to-the-brim suitcases. My pots and pans have found homes at a thrift store. My car, Daisy, has found a sassy new owner. My kombucha SCOBY continues her brewing in another kitchen’s cupboard. The cat food I throw down from my balcony to my alley cats, Black Lightening and Simba, has found its way into the hands of another crazy cat lady. My house is empty, my heart is full, and adventure awaits. Peel sweet potatoes and cut lengthwise into ¼ inch (0.6 cm) thick matchsticks (erring on the side thinner fries if your knife skills are atrocious like mine and you can’t seem to make them all the exact same size). 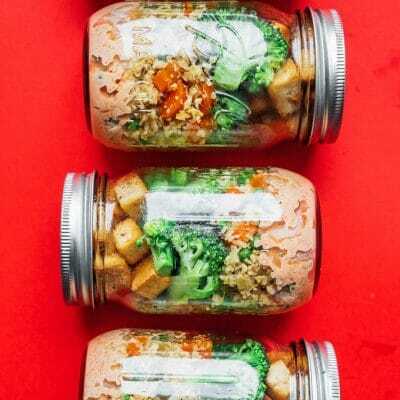 Place matchsticks into a bowl of ice cold water and set in fridge for a few hours (anywhere from 1 hour to overnight)**. Remove matchsticks and pat dry. No worries if these aren’t 100% dry. Add 1 Tbsp of cornstarch to a plastic bag and toss in the sweet potatoes. Blow some air into the bag and shake shake shake. Potatoes should be lightly, evenly coated in cornstarch (add more cornstarch as necessary). Lay potatoes on a parchment paper-lined baking sheet and drizzle with oil. Toss the potatoes around to evenly coat each with oil, then arrange fries so that none are touching and each has plenty of room to breathe and let out moisture (you may need to use 2 pans). Bake fries at 425 degrees F (232 C) for 20 minutes. Remove, flip the fries, rotate the pan, and cook for another 20 minutes, or until fries have begun to brown. Remove from oven and sprinkle with salt. Serve hot with avocado dipping sauce! (Make this while the taters cook!) 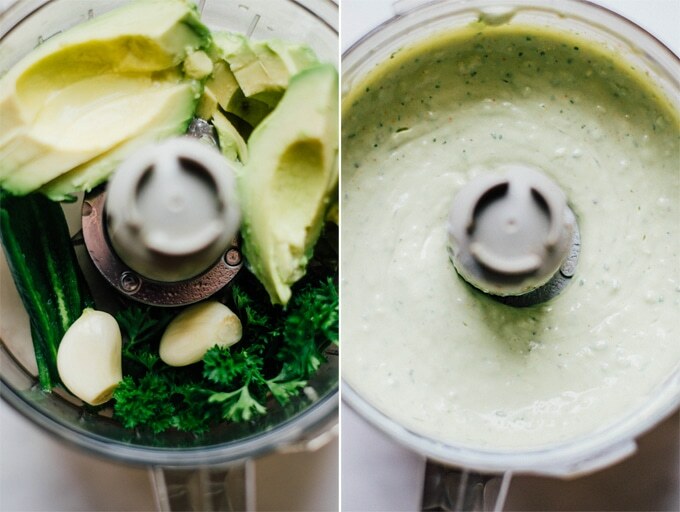 In a food processor, mix avocado, lime juice, garlic, parsley, and jalapeno until smooth. Add Greek yogurt and continue to mix until smooth. If desired, add a dash of milk to thin the sauce to a texture of your liking. Add a pinch of salt and pepper to suit your taste. **This step is important in drawing out excess starches! This helps to give your fries that crispy on the outside, tender on the inside texture. 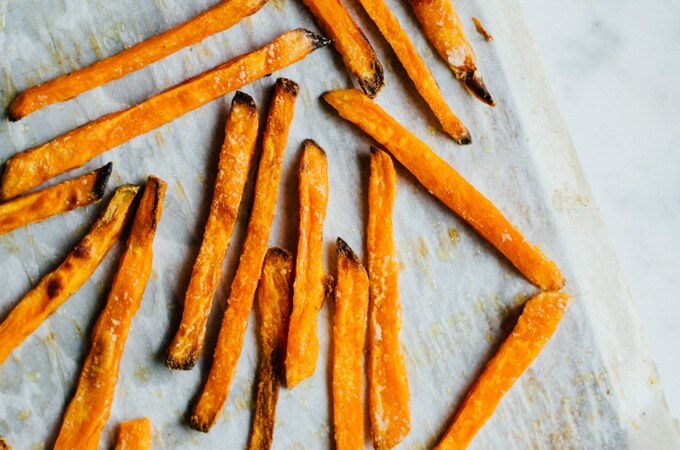 LOVE sweet potato fries and so do the kiddos. I’ve never soaked them in water before baking – I will definitely try this next time! 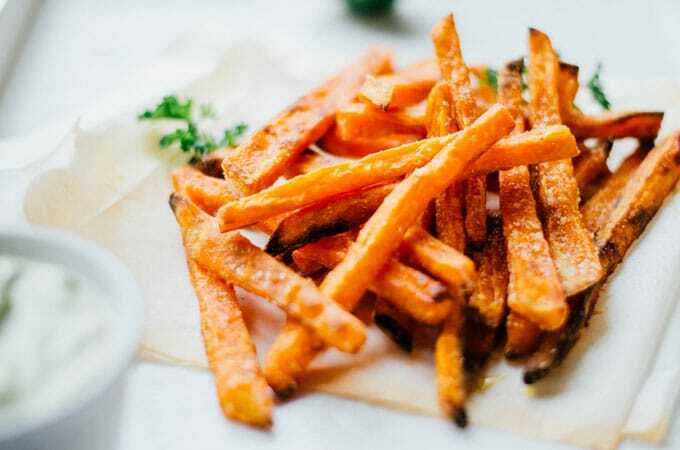 Sweet potato fries are the best, I make them all the time and they never last for very long! I’ve not tried the soak-in-water-before-bake method before so I shall give that a try. And the avocado dipping sauce…yum! These lasted all of about 20 minutes! Let me know how it goes, Bree! OMG – just step aside, because I’m going to have to devour those! Love the dipping sauce, too! Hahah exactly my reaction when I pulled em out of the oven! This look amazing! Definitely have to try! These look perfect! 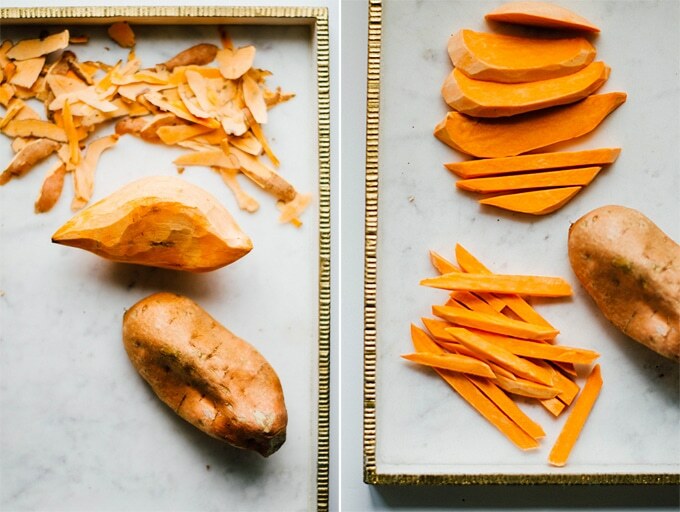 We always soak potatoes and sweet potatoes in water to remove the starchiness before baking or frying and I love that you included that step in here. 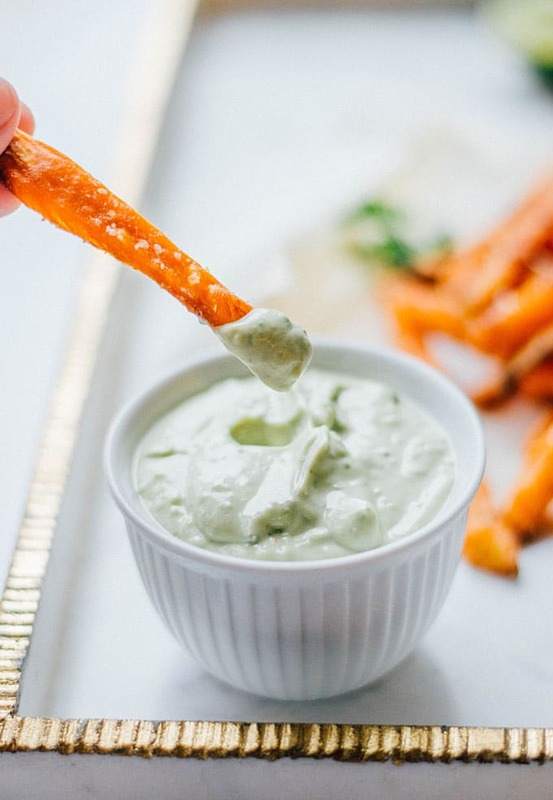 The avocado dipping sauce is a genius idea and sounds like a wonderful pairing with sweet potato fries. Can’t wait to make these! Yum! Sweet potato fries are my favorite! Definitely making these. These look so yummy! 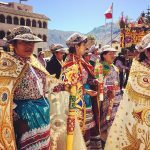 As well as the photos being fantastic! Good luck on your move. 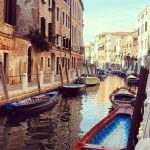 I can’t wait to read about your adventures in Europe. I wish I had the guts to give away everything and make a big move like that. Cheers to you! 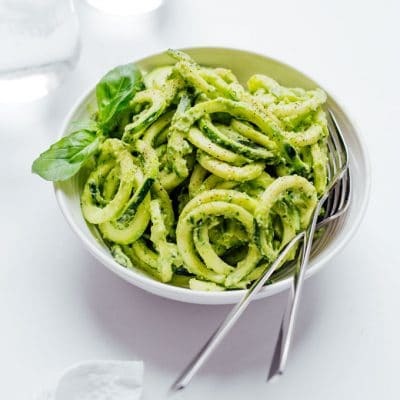 alright I’m a sucker for fries so I’m very excited to try this healthier option with the to die for looking avocado sauce! Yes you have to try them!! 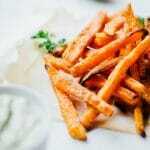 Vitamin A bombs + lower in fat + they’re still as addictive as regular fries = EAT ALL THE FRIES! Oh my God, this looks so delicious!! I love fried potatoes but I never tried them with avocado sauce! I definitely need to try it out!! First, congratulations on your big adventure. I can feel your excitement. 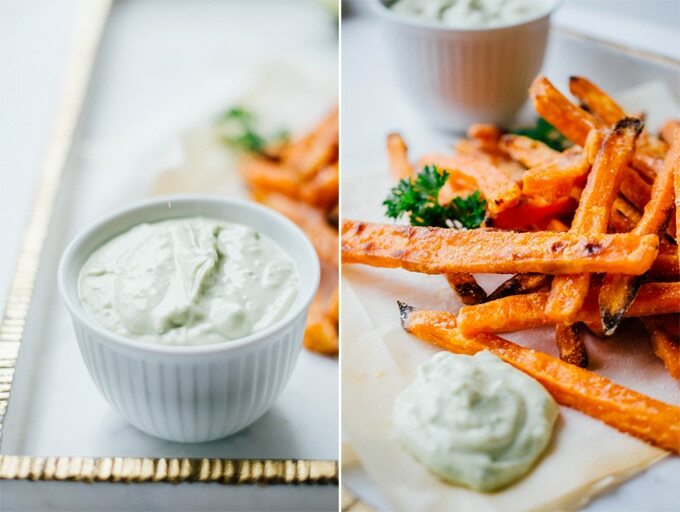 I am excited to try your method – my sweet potato fries are always soggy, plus that dressing sounds diving. Thanks so much Tara! Yea I was DETERMINED to make these anything but soggy. And with the cold water + cornstarch it was a success! These fries AND avocado sauce. I need these now!! I’ve tried making sweet potato fries a couple times and they never quite come out how I want them to. I’l definitely give your recipe a try! I’m not a huge fan of avocado, but this looks so good! …soooo this looks absolutely amazing! I can’t get enough sweet potatoes, I live on avocados, what a perfect recipe! Can’t wait to try! And eat! This is such a wonderful recipe, thank you for sharing! I can’t wait to try it!! I love all sweet potatoes! I have not had any luck making these before, but I’ve never soaked them in cold water. I’ll have to try that step. That dipping sauce sounds amazing! I never would have thought to put the two together but it sounds like something I could eat a whole plate of! Lovely photography steps. I can’t wait to try it! 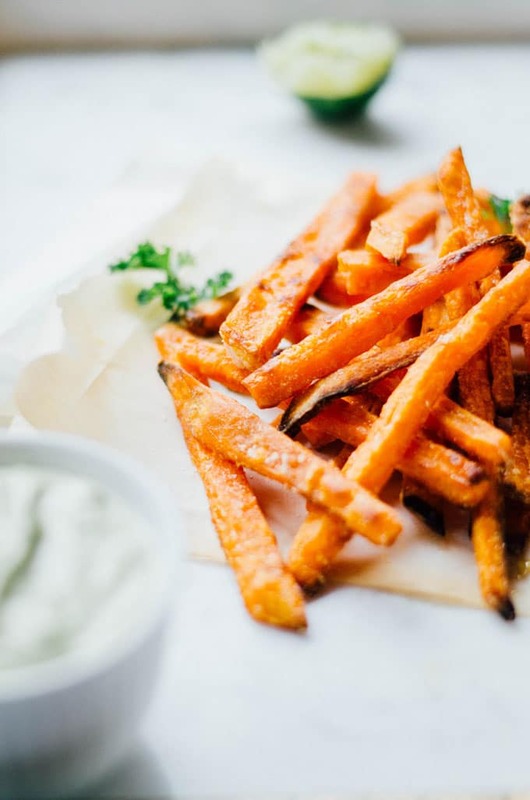 I love sweet potato fries, great idea to pair the with an avocado dipping sauce, it sounds like a delicious combination! What a cliff hanger! I am now so curious about your new adventure I’ll be back to find out what your up to! Sounds so fun, starting a new adventure is heroic! Good for you! Now, fill us in! 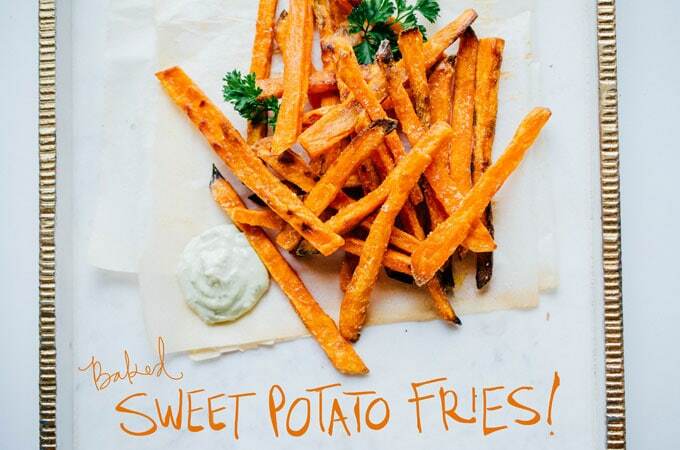 And by the way, We love sweet potato fries! yours look really yummy! These look SO good and the pictures are gorgeous! 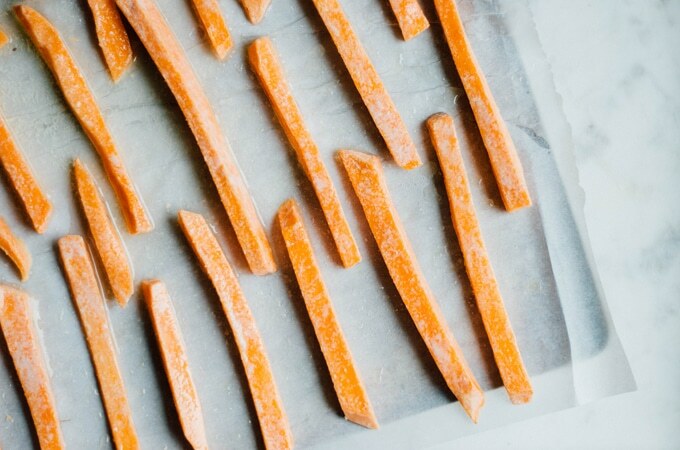 Sweet potatoes fries make such a great snack or side. I love the unique dipping sauce with these! I love sweet potato fries! One of my favorite restaurants serves them with a tarragon sauce that I want to bathe in!! I might have to play around and see if I can copy it. Hi Yuki! You can use any pepper that’s available, adjusting the amount depending on how hot the pepper is. Perhaps 1 or 2 bird’s eye chilis?